Have you fancied taking a trip to the Red Sea? Not sure if Luxor would be your thing, Hurghada would be hot enough or if Sharm El Sheikh would suit you better? Well during February Holiday Hypermarket will be offering you a chance to get the answers to all your Red Sea questions! 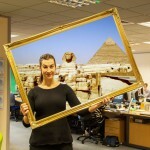 Starting 4th February Lauren will be in Hurghada ready to go and explore. The next stop is Luxor followed by a Nile Cruise and a stop gap in Sharm El Sheikh before spending some time in Makadi Bay. Lauren will be on Holiday Hypermarkets Facebook page whilst there making it the perfect time to find out more about this holiday hotspot! We’ve chosen our top 5 SplashWorld hotels around the globe. Each one offers something special and we're keen to share with you. Check them out!